Twitter was all about sharing terrible Hindi songs and Guy Kawasaki and Mallika Sherawat following everyone back. Till 2014 happened and along with India, even Twitter India changed. The microblogging platform is now hijacked by toxic people from either side of the political spectrum who believe in being holier than thou and dishing out moral certificates. 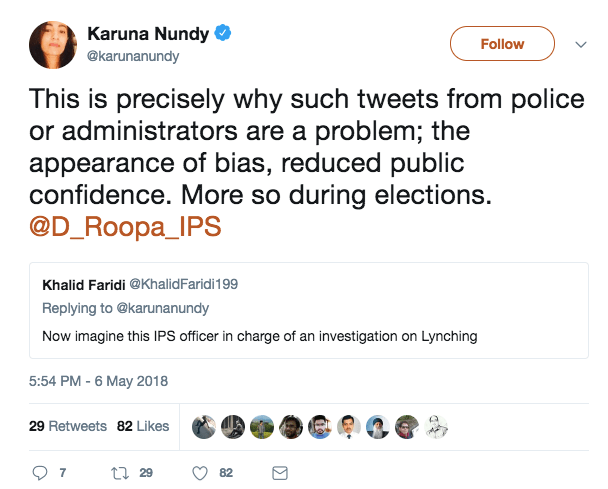 Supreme Court lawyer Karuna Nundy, who believes criminalization of triple talaq goes against freedom of speech, tried to moral police IPS officer D Roopa, who had shared her picture with BJP leader Dr Subramanian Swamy, who was instrumental in unearthing the 2G scam. Soon enough, those who identify themselves as ‘liberals’ and accuse people with opposing political views as ‘intolerant’, came out in swarm to question D Roopa on why would she get a selfie clicked with the man who brought the National Herald scam to public light. D Roopa, however, gave it back to most who were casting aspersions on the picture. No idea on that. Not aware really. I limit the tweet to what I actually tweeted and that’s indeed true. Supreme Court lawyer Karuna Nundy also jumped on the bandwagon and tweeted how she was ‘disappointed’ to see the image. Nundy didn’t just stop there, she also endorsed tweets which cast aspersions on D Roopa’s neutrality and work ethics. However, not to be bogged down by the bullying of so-called liberals, the IPS officer called her out for trying to play the dangerous divisive games on Twitter. Soon, Congress supporting lawyer Sanjay Hegde too chimed in and tried to shame her for admiring Dr. Swamy. D Roopa, however, took it in her stride and took the snide remark and turned it into a compliment. D Roopa was present at the Times Now conclave which saw a public debate where Dr Swamy destroyed Modi liar actor Prakash Raj. Perhaps the fact that the new favourite tool of the so-called liberals was left speechless, might have triggered the outburst. In tweets preceding this, she had tweeted pictures with AAP cheerleader and dishonest journalist Saba Naqvi, but none of these so-called liberals called her out on that. YouTube has now restored the pulled down OpIndia video, however, it has been put behind an age restriction.